The cancellation of the work is not an option. We will not move from here until the president of the republic, Juan Carlos Varela, comes to this place. The Honduran-owned GENISA company that’s building the Barro Blanco Dam? Their permits were obtained by fraud, and a member of their board of directors is in prison in Honduras for another fraud. The Dutch and German banks that backed GENISA? They didn’t do their due diligence, which would have exposed the fraudulent misrepresentation by the company and its Panamanian lawyers that no cultural sites were affected, when in fact the plan to flood the Tabasara River would destroy ancient petroglyphs that are protected by UN conventions and considered holy by the 60,000-member Mama Tata denomination that accounts for about one-third of the Ngabe indigenous nation. The Varela administration is offering jobs and development projects, but the destruction or removal of the petroglyphs is a nonstarter for anyone who wants to endure in the fractious world of Ngabe politics. A coup d’etat to replace the current general cacique of the Ngabe-Bugle Comarca, Silvia Carrera, who insists on the dam project’s cancellation and demolition? The company already tried that once. But Carrera and her allies in the April 10th Movement (M-10) do have ever stronger competition from the September 22 Movement (M-22) — which should be no comfort to those who want the dam project to proceed. So are Dutch and German bankers, and Panama’s Chamber of Commerce, insistent? None of them live in the area to be affected by the dam. None of them are indigenous, speak Ngabere or stand to be directly affected by a religious conflict that would be sparked if Carrera signed off on a deal to destroy a place that’s sacred to a large part of her constituency. Ever the defender of its members’ property rights, the chamber routinely supports the dispossession of impoverished rural communities. The fraud artists — those who commissioned, concocted and filed the dishonest environmental impact statements — are letting other people do their bidding and have not been called in to be interrogated by prosecutors. Polls show that by about a two-to-one margin Panamanian believe that they know exactly what is going on and support the indigenous side in the dispute. That leaves the GENISA supporters with the usual rabiblanco divide and rule tactics in the face of a strong majority. Might there be major national power outages for which Silvia Carrera is blamed? The Martinelli administration already played that card. But the main problem is that the division which is there to play is between rival factions that claim to be more militantly opposed to the dam than the other. In the last elections for the Ngabe-Bugle General Congress, the Electoral Tribunal took a census in a season when migrant farm workers were away picking crops and eliminated much of the electorate from the poll list. Ricardo Martinelli’s people poured significant government resources into the campaigns of those with whom they intended to take over the comarca’s government — and lost to the PRD, with many people who were not on the poll lists boycotting. Martnielli then bribed enough of the PRD-aligned delegates who were elected go get one of his followers elected as president of the congress — but nobody respected that man and the notion that he and those who voted for him would choose a general cacique was a nonstarter. Instead they called an election for general cacique. The Electoral Tribunal restored the voting rights of most of those who had been disenfranchised in the previous voting, but there was also a widespread boycott of that election. Lo and behold, farmer and craftswoman Silvia Carrera, an activist in the movements against dams and strip mines in the comarca, walked from village to village and won the election. Carrera had the support of a lot of the teachers, who are mostly members of the Veraguas Educators Association (AEVE), a militant union whose leaders are aligned with Juan Jované’s faction of the left. But the election she won was boycotted by traditional leaders who object to any role for such outsiders as the Electoral Tribunal in indigenous self-government and by those aligned with Genaro López’s faction of the left. Among the most insistent opponents of elections run by non-indigenous authorities were the members of the Mama Tata denomination, a syncretist religion with both Christian and traditional indigenous roots that was preached by their late prophet Mama Atencio in the 1960s. The traditionalists called a Traditional Ngabe-Bugle General Congress to conflict with the government-sponsored elections and chose its own general cacique and officers who claim to be the legitimate authorities in the comarca. The local Buko Day police force takes directions from Carrera rather than the traditionalists or Martinelli’s discredited congress. Carrera avoided a major power struggle with the traditionalists and soundly thrashed the Martinelli people when they tried to remove her. But as the impasse over the Barro Blanco Dam has dragged on, a new alliance that includes the Mama Tata faith, the Traditional Ngabe-Bugle General Congress and FRENADESO supporters has been camped out near the dam construction site, carrying out protests and participating in the talks with the government as the September 22nd Movement. While M-10 and M-22 trade insults and pursue separate tactics, there is no division between the about whether to accept the dam. The resumption of work on the dam was accompanied by police moving into the M-22 campsite. The talks dragged on with neither side budging and new leadership emerging in Silvia Carrera’s part of the indigenous side, with Rolando Carpintero, the mayor of the Muna district of the comarca of which the places to be flooded are a part, taking a high profile. 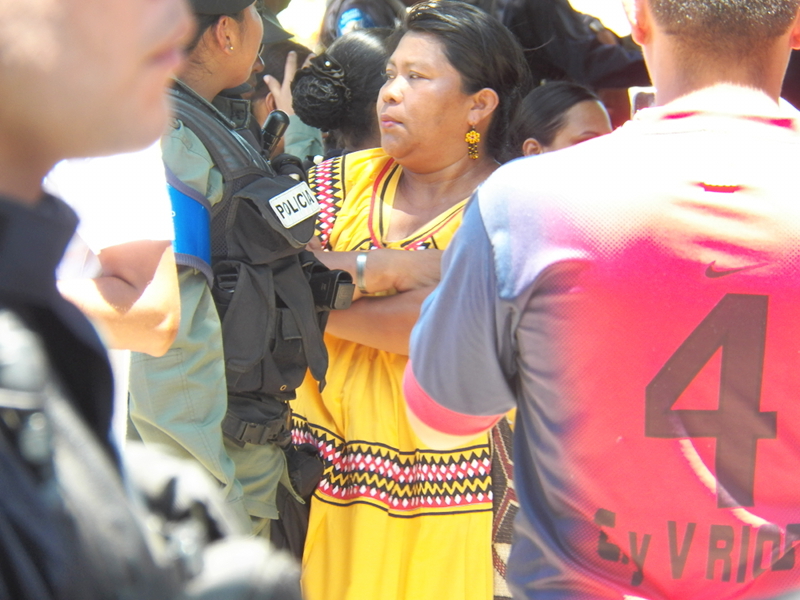 On the M-22 side Mama Tata leader Clementina Pérez Jaramillo has emerged as the principal spokeswoman. On July 25 a small group of M-10 supporters blocked the Pan-American Highway near Tole and the police moved in to clear the road. There were 20 arrests and some rough play that caused some injuries that were not life threatening. Although those who were arrested were quickly released M-10 has taken the occasion to withdraw from the talks and La Prensa reports that people have been walking down from the largely roadless hills of the comarca to reinforce the protesters near Tole. M-22 has not formally withdrawn from the talks, remains encamped near the dam and has filed a lawsuit with the Inter-American Human Rights Court to enjoin further work on the dam. The government and M-10 have called for United Nations mediation. During the Martinelli administration there had been UN mediation but when the mediators found justice in the indigenous cause the government just ignored them. The impasse continues, but the situation is far from static.